In the early 1900s, hillside developments in Los Angeles often used the same design template as the flat lots in the valley below. These layouts – typical for the time period – had the main living and dining rooms facing the street. On the hills, this layout only worked on an uphill lot where the main rooms also faced the view; a downhill lot with a parallel floor plan would face the house across the street instead of the view out the back. For one of these downhill homes, the solution was obvious but a challenge to achieve. Designer and founder Steve Pallrand of Los Angeles-based Home Front Build worked to not only switch around the layout and open it to the view but also to appeal to his client’s taste in traditional Japanese design. According to the designer, his task was to create a more finished façade in the kitchen to better blend it with the living and dining areas. He also wanted the new kitchen to embrace the scenery outside. The walls blocking the kitchen from the living areas and the view were removed, creating a wide-open great room that could look out on the landscape with new panoramic windows. Pallrand and his team used AutoCAD for the cabinet layout of this new space, but for the initial meetings they relied on hand-drawn sketches. The mood he wanted to convey is that of a simple yet bold Japanese design for his Japanese-American client. To do this, he utilized materials with minimal movement and similar palettes, like the soapstone countertops and matching gray pendants above. 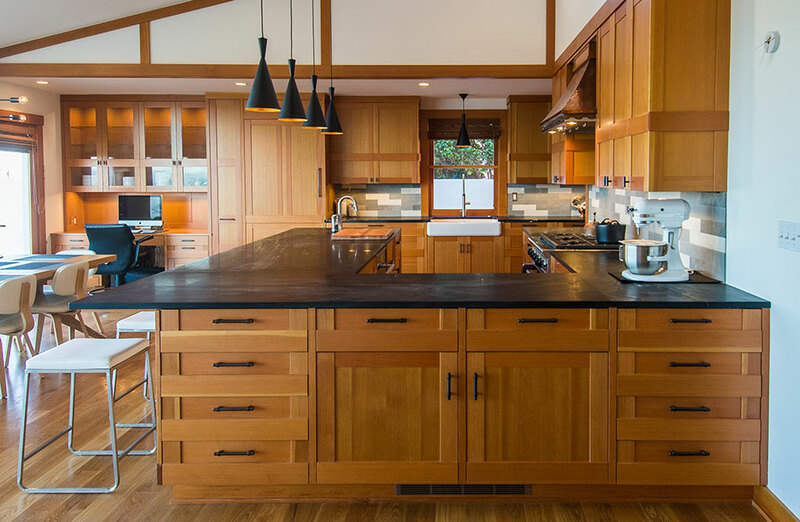 The cabinetry, a bright Douglas fir, has a modern Asian-style door with a minimalist rectangular frame. The contrast of the warm cabinetry, the cool gray countertops and stainless-steel appliances create interest in the minimalist space without detracting from the views. Modern matte-black hardware and a backsplash of elongated subway tile in shades of white and gray add to the bold contrast of light and dark. Instilling the bathroom with Japanese design felt natural to Pallrand and his client. The act of bathing is deeply rooted in Japanese culture and is associated with relaxation and cleansing, rather than a chore necessary to get out the door. “The bathrooms draw even more heavily on traditional Japanese architecture with rich use of wood, tonsu cabinetry – traditional mobile storage indigenous to Japan – and tile textures,” said Pallrand. The footprint of the bathroom was small, so the design team laid it out with a curbless shower with no frame. A freestanding tub is placed next to the shower area, with the vanity and toilet on the opposite side of the room with no dividing walls. This open floor plan makes the room feel spacious and relaxing. To infuse the space with functional warmth and to reference Japanese baths, the design team used Douglas fir wood for the wall paneling, trim and cabinetry. The splash area around the bath and shower is lined with gray stone tile for durability purposes and to contrast the wood. This use of natural materials creates the relaxing appeal the client wanted. “Like traditional Japanese baths, the master bath is meant as a place to unwind and linger,” said Pallrand. Newer PostMansion Global, March 2019.